But Stein argues that the funds can be found. Going beyond Bernie, she calls for large cuts to the bloated military budget, which makes up 55% of federal discretionary spending; and progressive taxation, ensuring that the wealthy pay their fair share. Most controversial, however, is her plan to tap up the Federal Reserve. Pointing to the massive sums the Fed produced out of the blue to bail out Wall Street, she says the same resources used to save the perpetrators of the crisis could be made available to its Main Street victims, beginning with the students robbed of their futures by massive student debt. Is tapping up the Fed realistic? Putting aside for the moment the mechanics of pulling it off, the central bank has indeed revealed that it has virtually limitless resources, as seen in the radical “emergency measures” taken since 2008. How much more was revealed in 2011, after an amendment by Sen. Bernie Sanders to the 2010 Wall Street reform law prompted the Government Accounting Office to conduct the first top-to-bottom audit of the Federal Reserve. It revealed that the Fed had provided a whopping $16 trillion in secret loans to bail out American and foreign banks and businesses during the economic crisis. “This is a clear case of socialism for the rich and rugged, you’re-on-your-own individualism for everyone else,” said Sanders in a press release. Then there was the shocker of “quantitative easing” (QE), an unconventional monetary policy in which the central bank creates new money electronically to buy financial assets such as Treasury securities and mortgage-backed securities (many of them “toxic”) from the banks. Critics said QE couldn’t be done because it would lead to hyperinflation. But it was done, and that dire result has not occurred. Unfortunately, the economic stimulus that QE was supposed to trigger hasn’t occurred either. QE has failed because the money has gotten no further than the balance sheets of private banks. To stimulate the demand that will jumpstart the economy, new money needs to get into the real economy and the pockets of consumers. The alternative is to do what governments arguably should have been doing all along: issue the money directly to fund their budgets. Central bankers have largely exhausted their toolkits, prompting some economists to recommend some form of “helicopter money” – newly-issued money dropped directly into the real economy. Funds acquired from the central bank in exchange for government securities could be used to build infrastructure, issue a national dividend, or purchase and nullify federal debt. Nearly interest-free loans could also be made by the central bank to state and local governments, in the same way they were issued to rescue an insolvent banking system. Just as the Fed bought federal and mortgage-backed securities with money created on its books, so it could buy student or other consumer debt bundled as “asset-backed securities.” But in order to stimulate economic activity, the central bank would have to announce that the debt would never be collected on. This is similar to the form of “helicopter money” recently suggested by former Fed Chairman Ben Bernanke to the Japanese, using debt instruments called “non-marketable perpetual bonds with no maturity date” – bonds that can’t be sold or cashed out by the central bank and that bear no interest. The Bernanke proposal (which he says could also be used by the US Fed in an emergency) involves the government issuing bonds, which it sells to the central bank for dollars generated digitally by the bank. The government then spends the funds directly into the economy, bypassing the banks. Something similar could be done as a pilot project with student debt, Stein’s favorite target for relief. The US government could pay the Department of Education for the monthly payments coming due for students not in default or for whom payment had been suspended until they found employment. This would free up income in those households to spend on other consumer goods and services, boosting the economy in a form of QE for Main Street. In QE as done today, the central bank reserves the right to sell the bonds it purchases back into the market, in order to reverse any hyperinflationary effects that may occur in the future. But selling bonds and taking back the cash is not the only way to shrink the money supply. The government could just raise taxes on sectors that are currently under-taxed (tax-dodging corporations and the super-rich) and void out the additional money it collects. Or it could nationalize “systemically important” banks that are insolvent or have failed to satisfy Dodd-Frank “living will” requirements (a category that now includes five of the country’s largest banks), and void out some of the interest collected by these newly-nationalized banks. Insolvent megabanks, rather than being bailed out by the government or “bailed in” by their private creditors and depositors, arguably should be nationalized – not temporarily, but as permanent public utilities. If the taxpayers are assuming the risks and costs, they should be getting the profits. None of these procedures for reversing inflation would be necessary, however, if the money supply were properly monitored. In our debt-financed system, the economy is chronically short of the money needed to support a dynamic, abundant economy. New money needs to be added to the system, and this can be done without inflating prices. If the money goes into creating goods and services rather than speculative asset bubbles, supply and demand will rise together and prices will remain stable. Is It in the President’s Toolbox? Whether Stein as president would have the power to pull any of this off is another question. QE is the province of the central bank, which is technically “independent” from the government. However, the president does appoint the Federal Reserve’s Board of Governors, Chair and Vice Chair, with the approval of the Senate. Failing that, the money might be found by following the lead of Abraham Lincoln and the American colonists and issuing it directly through the Treasury. But an issue of US Notes or Greenbacks would also require an act of Congress to change existing law. In minting the $1 trillion platinum coin, the Treasury Secretary would be exercising authority which Congress has granted routinely for more than 220 years. The Secretary authority is derived from an Act of Congress (in fact, a GOP Congress) under power expressly granted to Congress in the Constitution (Article 1, Section 8). The power just needs to be exercised, something the president can instruct the Secretary to do by executive order. In 1933, President Franklin Roosevelt engaged in a radical monetary reset when he took the dollar off the gold standard domestically. The response was, “We didn’t know you could do that.” Today the Federal Reserve and central banks globally have been engaging in radical monetary policies that have evoked a similar response, and the sky has not fallen as predicted. The runaway success of Sanders and Trump has made it clear that the American people want real change from the establishment Democratic/Republican business-as-usual that Hillary represents. But real change is not possible within the straitjacket of a debt-ridden, austerity-based financial scheme controlled by Wall Street oligarchs. Radical economic change requires radical financial change, as Roosevelt demonstrated. To carry the baton of revolution to the finish line requires revolutionary tools, which Stein has shown she has in her toolbox. This entry was posted in All Posts News Politics and-or Videos, Economy, Federal Reserve, Green Party, Politics and tagged 2016 Election, Basic Income, Bernie Sanders, Ellen Brown, Jill Stein, Quantitative Easing. Bookmark the permalink. I didn’t mean to harsh out on the Greens. As I said, I have voted a few times for the Harris County Greens and I think the off-year non-partisan voting system in Houston is a good chance to get Greens into power. I think that’s why the Green Party had their convention in Houston last week. I might even vote for Stein if Trump still has a hold on Texas. But if Trump falls so far that Texas is in play, I’ll vote Hillary. I know that’s heresy here, but I want to flip Texas and get us the next Ann Richards in two years. first off – Texas is not in play . second off – if you are thinking lesser of two evils … it’s Trump . third – safe state swing state is why we are in this mess to begin with and why the progressive left has become regressive . fourth off – Trump is gonna win this election . by the time Wikileaks is done with Hillary Clinton , she will be toast . vote as you please . my position has always been to invest in third parties across the board . Who’s going to prosecute Clinton? who will prosecute Hillary . the Voters in Nov . of course . that is what I mean by toast . I’ve been listening to all the Green Party Convention videos, it’s too easy to just focus on the obvious hiccoughs, technical glitches, even the ‘veganomics’ ~ so, seriously…what’s really interesting about Green politics, is not only that it attracts really honest and decent folk, but that it is a global phenomenon. It is also genuinely multicultural, biophilic, innovative and indigenous. There are a lot of Green parties in Latin America. It could develop into the first planetary party ~ if it isn’t already….how else do you defeat neofascism? The real answer: use weapons they cannot even recognize, let alone understand, or defend themselves against ~ real weapons like truth, justice, literacy, education, stewardship, treaty law, community organics, agroecology, ergonomic engineering, biomimicry, permaculture trusts, art, music, social networking…you know what else, because that is the beauty of it; it’s down to us to make that difference ~ individual empowerment through shared responsibility…rather than dictatorship by stolen privilege, lies and deceit! Thanks, David. 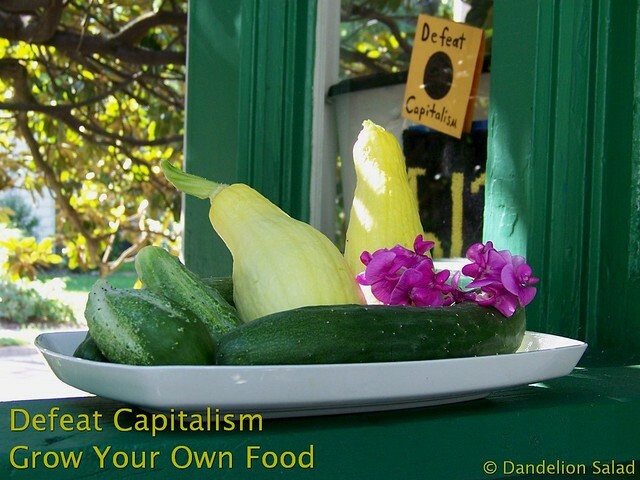 I saw my little “Defeat Capitalism” sign in the window when I took a photo from one day’s harvest and thought it could have those words on the photo, so added them there. Gardening has been rough this season. It started out with a drought, then very high temperatures, then downpours of rain to the point of flooding. A bit drastic for the plants, to say the least. I’m happy to have what I do have in my garden this year. Greens came into power in Germany in 1986 . One of the reasons that Germany did not get involved in the Iraq war . Important reminder…thanks R. I’m picking up prospective hints of jade green from China….prolific shades of African gardens….but, it’s the US that has that can-do know-how….! I have voted Green a few times, but I don’t take the Green Party seriously. You can’t just run Nader or Stein for president and call yourself a serious party. You gotta start at the bottom and build a bench of strong local leaders. You need to level up and get some high XP heroes before you can take on the Big Boss. Some folks from Occupy Houston got involved with the Harris County Green Party. Remington Alessi had some success in his run for Sheriff in 2012. Having a viable candidate for President is a 25 year effort that should have started 30 years ago. It might be possible to have viable candidates in as short as twelve years. Study how the Republican party became ascendent in the South starting in the early seventies. They worked from the bottom up and remade America. Greens can do it too, following the same model. I agree with you. 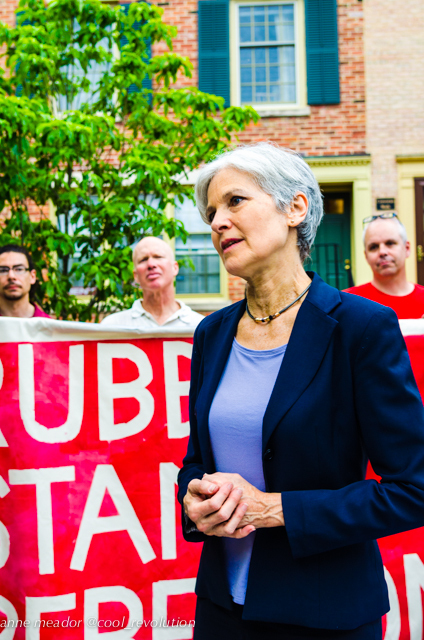 There has been lots of disorganization with the Green Party over the years. I’m still going to vote for Jill Stein. Greens have done it . check city councils in different places in US . check John Eder – in the House in Maine . also on water boards etc . Peter Cameo – Green who spent decades in Cal working with business community and Environmental . also – Seattle – Green backing Socialists . the list goes on . the simplest approach is simply to nationalize the 5 biggest banks and making them loan money to startups. This would create a bunch of bad loans, as it has in China. Big deal, they would be loans eventually written off as the Chinese do. However, nationalizing the banks would require a revolution, since the banksters would oppose it with their enormous assets.